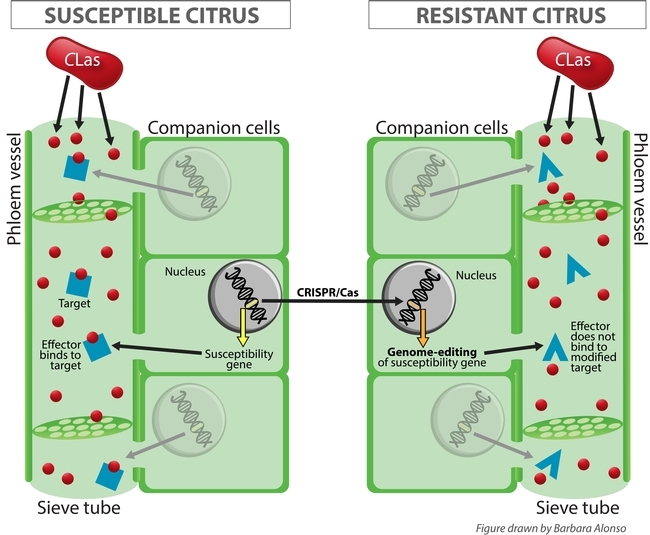 Scientists are studying the interaction between citrus trees and the bacterium Candidatus Liberibacter asiaticus (CLas) associated with huanglongbing (HLB) at the molecular level. 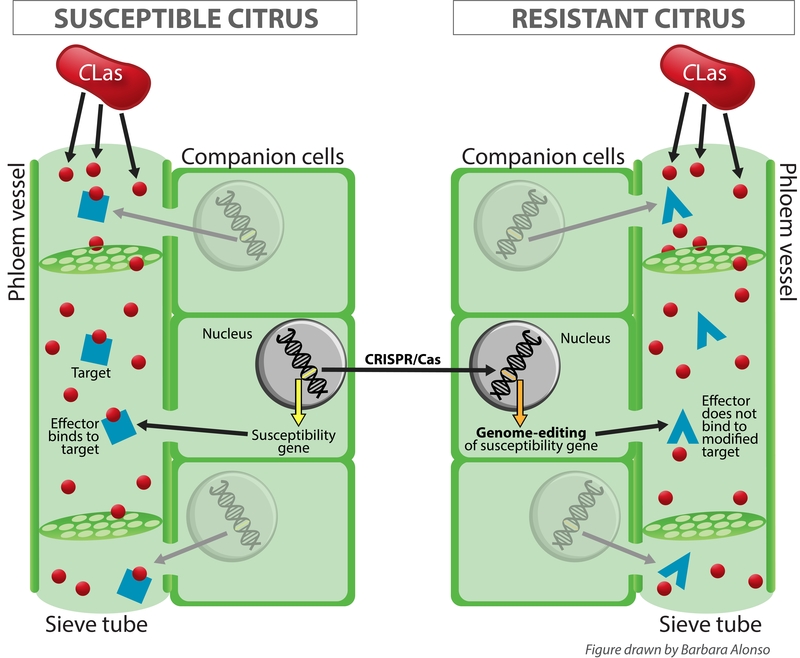 In particular, they are investigating how CLas interacts with citrus proteins to cause disease, hoping to disrupt this interaction and ultimately develop new resistant or tolerant varieties using a genome-editing technology called CRISPR/Cas. Plants defend themselves from pathogens and insect feeding by producing proteins that enhance their resistance to these organisms. This is called systemic acquired resistance (SAR). Specific defense genes code for pathogenesis-related (PR) proteins that protect plants from microorganisms and are induced by a plant hormone called salicylic acid. 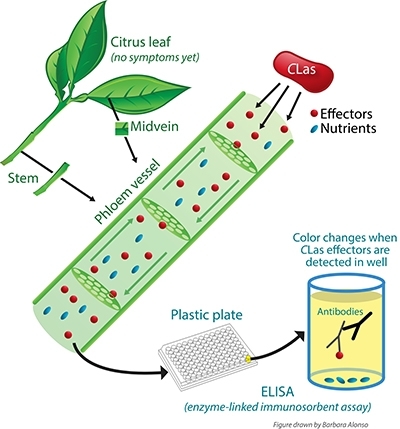 The defense genes from resistant or tolerant plants can be inserted into less tolerant plants, thereby improving their resistance to diseasesResearch is underway to transform the rootstock with the hope that it will boost the immunity of the entire tree. Dr. Johan Leveau, a Professor of Plant Pathology at UC Davis, is comparing the differences between healthy citrus trees and citrus trees infected with the bacterium Candidatus Liberibacter asiaticus (CLas), that causes Huanglongbing disease (HLB). The most obvious difference is the presence of CLas DNA in infected plants. Polymerase Chain Reaction (PCR) is a test that can detect CLas DNA and is currently the only way to confirm the presence of the bacterium in trees. However, for PCR-based methods to work, the bacterium must be present in the plant tissue tested and the chance of sampling a leaf that has the bacterium is low when the tree is in the early stages of infection. 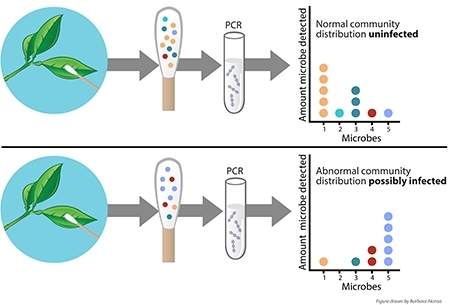 There is much interest in developing an alternative method of CLas detection using methods that take advantage of the tree-wide changes that occur upon initial infection. Dr. Leveau's research has discovered that microbial communities living on the surface of citrus tree leaves change during CLas infection. Leveau's team collects microbes from foliage by swabbing leaves, uses DNA-based methods to profile the bacteria and fungi that are present on the swab sample, and compares the profiles of CLas -infected and uninfected trees. If successful, this method would reduce the cost of sampling for CLas, greatly increase the number of trees sampled, and help tree removal get ahead of the disease epidemic. 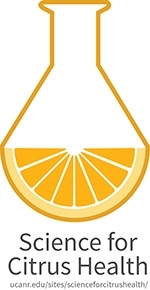 Huanglongbing (HLB, or citrus greening) is a bacterial disease of citrus, which represents a crippling threat to the U.S. citrus industry. The responsible bacterium, Candidatus Liberibacter asiaticus (CLas), is spread by the Asian citrus psyllid, Diaphorina citri. This invasive insect, first found in Florida in 1998, is now present in all U.S. citrus-producing states. 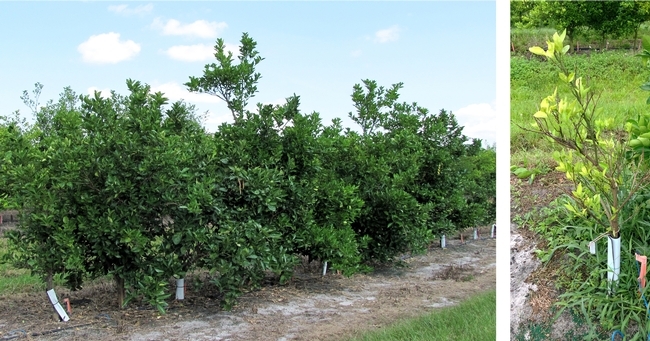 In Florida, HLB infection affects most orchards, reducing yields and escalating grower management costs and the complexity of citrus management. CLas is spreading in Texas and in the past year has begun to accelerate its spread in Southern California. It is imperative to inform growers and consumers about the research and approaches that are being pursued to control the spread of the disease. Through both the NIFA-sponsored NuPsyllid and RNAi-based strategy projects, we are developing extension and education information for growers and end-users, which address the use of genetics and other tools to lessen the impact of HLB on citrus. We developed a plan that enhances existing citrus extension educator programming with three primary outreach approaches. 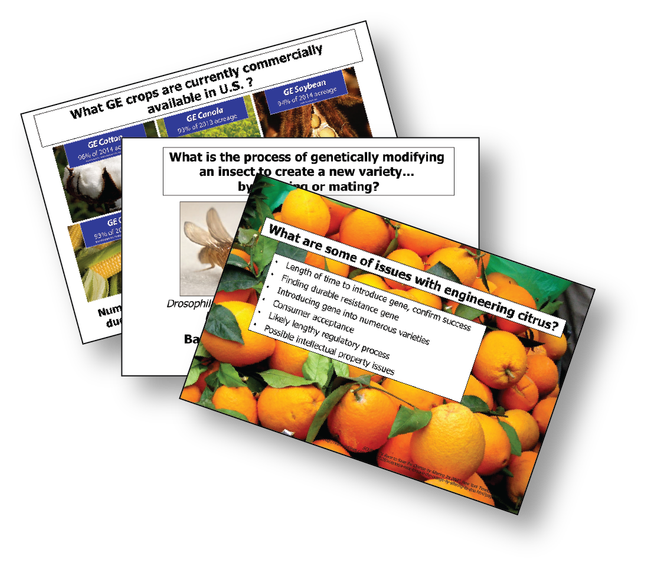 This site is specifically designed to provide grower information on genetic and non-genetic strategies for control and detection of huanglongbing/citrus greening, and hosts the following three outreach resources. Extension and outreach personnel can tailor up to sixty PowerPoint slides for specific venues and locations – an important option due to the varying HLB situations in different states. 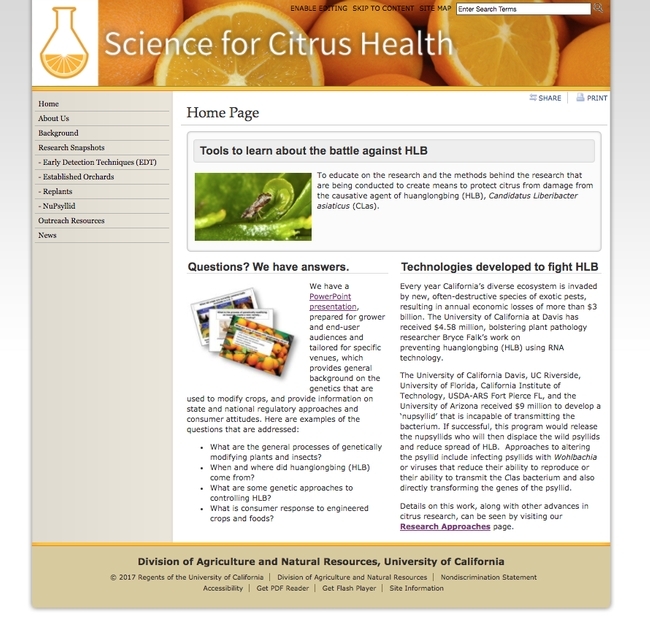 Slides cover a general introduction on genetic methods being used to modify plants, viruses, and insects to combat HLB, state and national regulatory requirements, consumer attitudes and what is being done with regard to engineering citrus itself, the insect vector, and the pathogenic bacterium. Depending on severity of disease in regions, there will be differences in what, where and how technologies will be used. 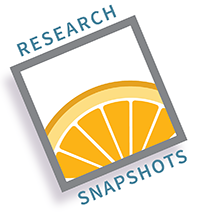 Snapshots are created to provide the latest information on various approaches being used to combat HLB. We work directly with researchers to obtain detailed information what they are doing, how they are doing it and the current status of their efforts. Research Snapshots, available on the website, can be used as fact sheets at educational venues. Snapshots are put into one of four categories, which are color-coded and interlinked to make use easier. New snapshots are being added each month. 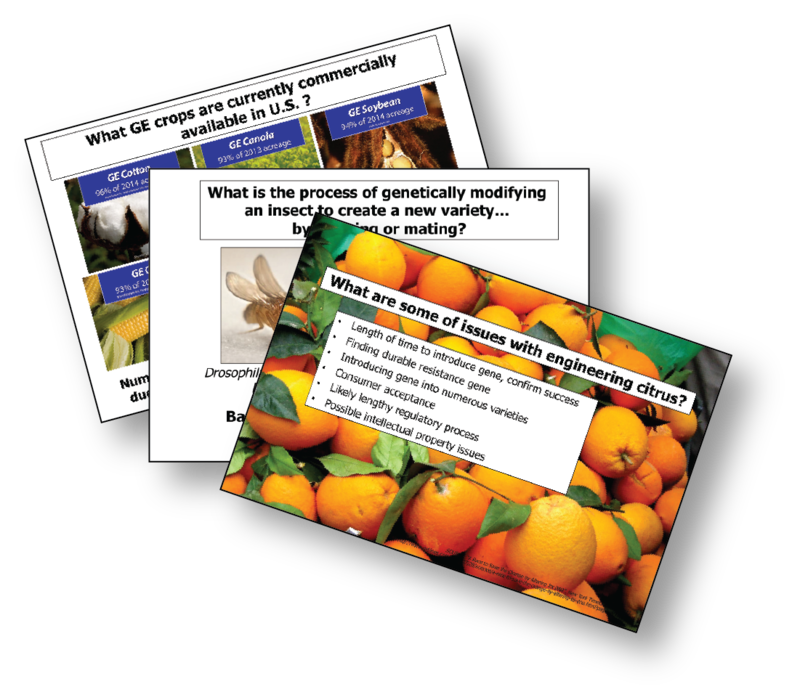 A fact sheet, which addresses general aspects of citrus genetics, “What Makes Lemon, Oranges and Limes Look and Taste Different?”, is available for download on the website.